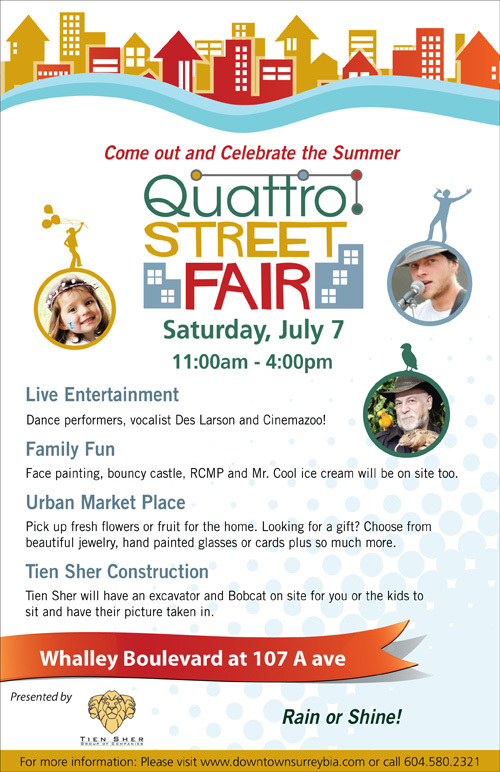 …Quattro Street Fair is happening on Saturday July 7th from 11:00am-4:00pm at Whalley Boulevard and 107 Ave? This summer celebration is presented by Tien Sher Group of Companies and will include an array of entertainment and family fun. Dance performers, Cinemazoo, face painting, a bouncy castle, Mr. Cool ice-cream, and an urban market place will be among the activities and attractions at this fair. Quattro Street Fair will surely provide fun for the whole family!